Mangaluru, July 03, 2018: The crude oil reserves in Dakshina Kannada and Udupi districts are the only solution during a national emergency. Underground crude oil storage plants with a total capacity of 3.55 million metric tons have been created in Mangaluru and Udupi to conveniently store crude oil which is to be used in case of an emergency. In relation to this, the central government has decided to create another crude oil storage plant with 2.5 million metric ton capacity at Paduru in Udupi. In this way, a total of 6.50 million metric tons of crude oil will be stored in Karavali. Currently, it the largest crude oil storage plant in the country to be used during an emergency. 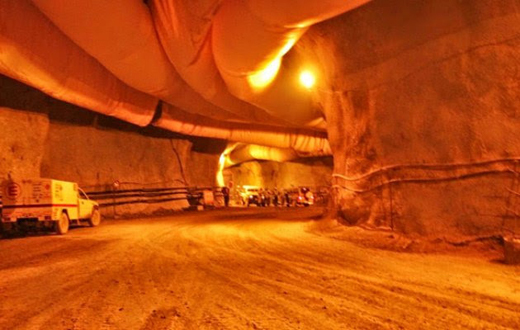 Three underground storage facilities have been created by Indian Strategic Petroleum Reserve Limited (ISPRL) which comes under petroleum ministry. The storage unit capacity at Padur near Udupi is 2.5 million metric tons (1,693 crore rupees cost), the storage unit capacity at Permude in Mangaluru is 1.5 million metric tons (1,227 crore rupees cost), 1.5 million metric tons capacity storage unit at Vishakhapatnam (1,178 crore rupees cost) and in this way, the target of 5.3 million metric tons of storage of crude oil has been set. An additional 2.5 million metric tons capacity storage unit will be created at Paduru. This reserve can satiate the oil requirements of the country for a period of 13 days during an emergency. 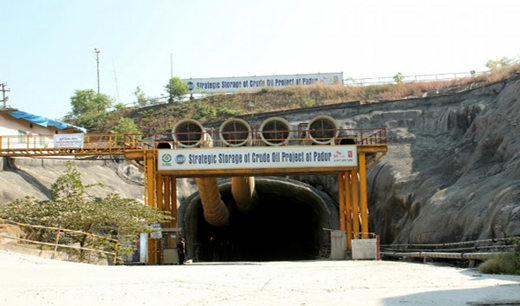 Sources have informed that with the creation of two storage units at Padur and Odisha, the total reserve capacity will be extended to 25 days in case of an emergency. Construction work at Paduru has completed and the petroleum ministry is yet to commence its filling. Oil from Iran and ‘Abu Dhabi National Oil Company’ (ADNOC) will be imported and stored at the storage unit in Permude. One part of the oil will be provided to India’s commercial consumers by ADNOC, while the remaining oil is reserved for the emergency. USA has set November 4th to be the deadline for India, China and other countries to stop importing oil from Iran. America has threatened economic sanctions if the deadline is missed. After Iraq and Saudi Arabia, Iran is the third highest crude oil providing country for India. 2.60 lakh metric tons of mixed crude oil was imported at Mangaluru through a massive oil tanker named ‘Dino’ on October 12th, 2017. This was stored at the storage unit in Permude. Additionally, 2.50 lakh metric tons of oil was procured from Iran through a huge oil tanker called ‘Greek Warrior’. Both of them have been stored in Mangaluru. For now, a minimal quantity of oil is imported from Iran for MRPL. As Indian government is thinking of importing oil from Iran in future, America’s stand may also affect the planning. The crude oil arriving on oil tankers at New Mangalore Port is brought to ISPRL pumping station at Thannirbavi through an oil jetty, from where the oil is pumped to the underground storage unit at Permude. To facilitate this, 48-inch pipelines have been installed to a distance of 12kms from Tannirbavi to Permude. 42-inch pipelines have been installed for a distance of 36kms from Permude to Paduru. Hello sir, is there any vacancies for BE graduates.